Rwenzori Mountains National Park is located in southwestern Uganda on the east side of the western (Albertine) African rift valley. 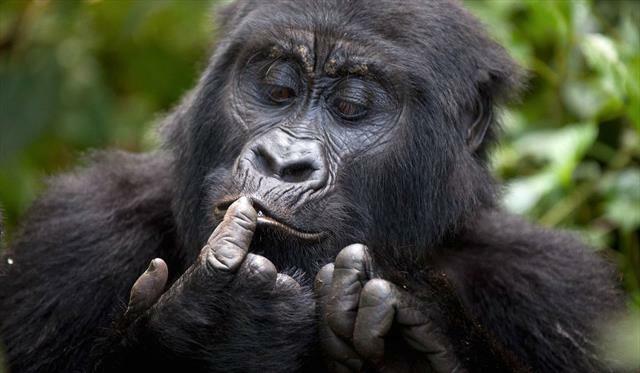 It lies along Uganda's border with the Democratic Republic of the Congo (DRC) and borders the DRC's Virunga National Park, also a UNESCO World Heritage Site, for 50 km. It is situated in the Bundibugyo, Kabarole, and Kasese districts, 25 km from the small town of Kasese. The park is 996 sq km in size, 70% of which exceeds an altitude of 2,500m above seas level. The park is 120 km long and 48 km wide. The Rwenzori Mountains straddle the equator along the border between Uganda and the Democratic Republic of Congo, extending north–south for about 110 km and east–west for about 50 km. Rising gradually from the highland plains of Uganda, the mountains fall steeply on the west to the Semliki River, the outflow of Lake Edward and a major tributary of Lake Albert, one of the sources of the White Nile. Geologically the mountains are young, created in the late Pliocene by an upthrust of crystalline rocks (mainly gneiss, amphibolite, granite and quartzite) that rose from within the western rift to divide palaeolake Obweruka and create present-day Lakes Albert and Edward. Hence, the range itself is not of volcanic origin although numerous craters (crater-lakes) of more recent age are found in the surrounding area. The Rwenzori are wetter than other East African mountains, with annual rainfall varying with altitude from 2,000 to 3,000 mm, and being heaviest on the eastern slope, which faces the prevailing winds. On the Uganda side heavy rain can occur any time of year, but the rainiest periods are from mid-March to May and from September to mid-December. This therefore means those on Rwenzori Mountain Hiking Safari should target the dry period of June to September. The equatorial position of the mountain range creates daily air temperature oscillations between −5°C and 20°C in the Alpine and Nival zones, an order of magnitude greater than the seasonal variation in maximum daytime temperature. Occasional night-time freezing occurs from 3,000 m altitude (the present-day boundary between Bamboo and Ericaceous zones); to 4,000 m (the Ericaceous–Alpine zone boundary) freezing occurs on 80–90% of the night.